Flora Design Plastic Bowls - 10 Ct.
Each bowl measures 24 oz. You would never believe these are disposables! 10 In. Flora Design Plastic Plates - 10 Ct.
8 In. Flora Design Plastic Plates - 10 Ct.
10 In. Trend White Plastic Plates - 10 Ct.
8 In. Trend White Plastic Plates - 10 Ct.
8 In. Versa Design Plastic Plates - 10 Ct. These stunning disposables are part of the Trendables™ collection of fine dinnerware. Each plastic bowl measures 24 oz. 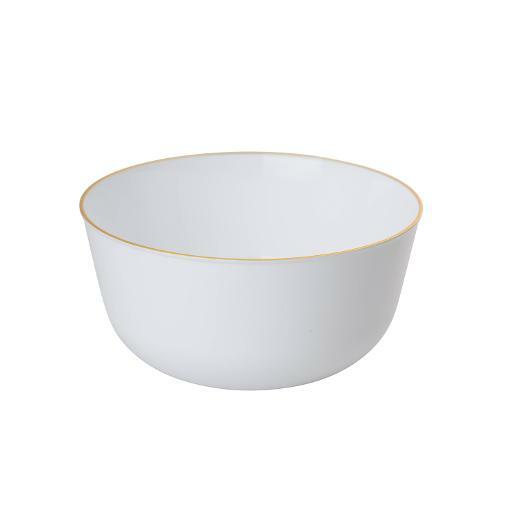 This bowl is part of the Flora series and features a solid white base with a gold hot stamped rim. Coordinates with additional Flora series disposables. Each package contains 10 exquisite bowls. L: 5.75 in. W: 5.75 in. H: 6.0 in.